Cooking Planit T-fal Giveaway is LIVE! How would you like to have this gorgeous set of T-fal Stainless Steel with Thermo-spot 12-Piece Cookware delivered to your front door? For one (or more!) of you lucky readers, that's exactly what is going to happen! There are 50 bloggers giving away this set of cookware. That's right, fifty! You can enter on all of the blogs listed below! My giveaway starts today and I am so excited! Whoever wins this set is going to love it. I was gifted this same set as a part of this crazy awesome promotion and I absolutely adore it. Check out my review of the cookware here or visit the T-fal website to take a closer look at this amazing prize. You'll also want to head on over to Cooking Planit and have a look around. 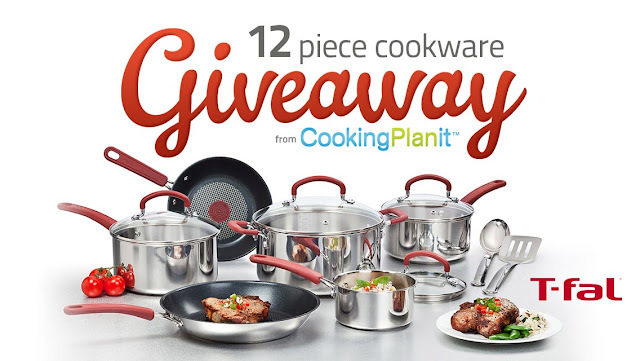 Cooking Planit is hosting this whirlwind of giveaways and registering for a Free Cooking Planit Account is a required method of entry to win the cookware. I have already registered for my Free Account and written a review of the website/app that you can find here. I highly recommend it. You will not be disappointed! Drop by their website and check it out or download the app on your iPhone or iPad today! So, let's get this thing started! My giveaway lasts for just one week (August 23rd - August 29th), but don't forget to stop by all of the other blogs and enter there, too. Think of your odds! Crazy good. Use the Rafflecopter Widget below to enter my Giveaway. Good luck, everyone! Contests open to US only. Limit one winner per household/per family from the 50 blogs participating in the promotion. If an individual is the winner of more than one giveaway, they will receive only one set of cookware and an alternate winner will be chosen for the other set(s). I have been gifted a set of cookware to review and give away as part of this promotion. All thoughts and opinions are my own. I'd like to make the Mexican Brunch meal - the Chaliquitas look like they taste good. I cannot wait to make the crab cakes w/ lemon mayo with that gorgeous TFal cookware! I'm most excited to make Chicken Meatballs with Sun-Dried Tomato Pesto. I want to make the fried brown rice and sweet potato hash. The Coconut poached scallops YUM! and broiled corn! Flank steak is something we have rarely but is very delicious. Looking forward to checking out Cooking Planit, and hoping to win the cookware! Sorry, I did not follow the instructions...I would like to make the turkey burgers with lemon dill yogurt. The Linguine with Roasted Garlic Sauce sounds yummy. I am most excited to make the Creme Brulee French Toast. I would love to make spicy black bean corn salsa. The Crispy Chicken with Lemon-Caper Sauce looks delicious! Spicy SOba Noodles sounds good! Super excited to make that sun dried sauce! YUM! I would like to make a stir fry so I could see how this compares to a regular wok. I would love to make the Zucchini and Chickpea Lasagna. I'd like to make the Chicken in the Garden meal. SIGN UP FOR FREE EMAIL UPDATES & NEVER MISS A RECIPE!